Radius Gauges | Fillet Gauges | How to use Fillet Gauges? Radius Gauges are also known for Fillet gauges. In metrology, Fillet gauges designed to check/measure both internal and external radii on curved surfaces. This is not a precision measuring instrument, rather it allows the user to quickly determine the fillet value. 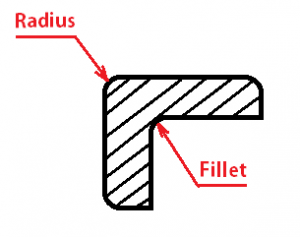 By the way, Are the Fillet and Radius are the same? In other cases, the fillet is the thing which is having no dimension. Which means when we see rounded corners we can call it as fillet whereas the round is the numerical notation on the drawing or in the CAD tool to represent how much amount of the fillet is required. So I would suggest using the fillet and round as different in the right conversations. in general, we can consider both might be the same. The Radius gauges made up of a set of blades as shown above. Each blade will be shaped with the fillet radius and the corresponding radius value will be stamped permanently on the blade itself. 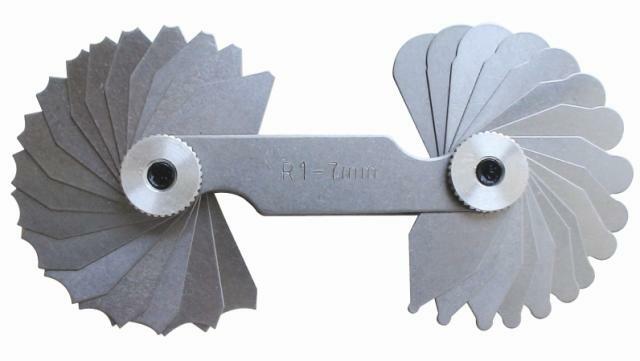 The gauge consists of two sets of blades on each side. you can see it in the above picture. One side is used to check the inside fillets and the other side blades are used to check the outside radius. We will go with the fillet gauge. that means we will check the inside fillet in a corner. See the following gif image. So that you can understand how we will place the Fillet gauge to check the Fillet value. To check the fillet, we need to roughly pick the nearest fillet gauge blade from the stack, and place the blade as shown above gif. Now the gauge curve and the workpiece fillet curve should match exactly as shown above. To make sure the curves have contacted correctly, we need to maintain a light on the other side, so that the light can pass thru the gap if there is existed. This is a similar process as the wire gauge measuring technique. Also, read about the Screw Pitch Gauge.